Sadly on the 7th of April , we lost our cat Marme to Feline Leukemia. Feline Leukemia is a common virus that infects cats through nasal secretions or other bodily fluids and causes lots of diseases, it is one of the causes of cancer in cats. We didn't know she even had it until it was too late,she was perfectly healthily until the last two weeks before she died. 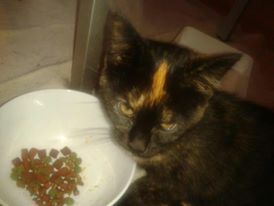 We got Marme from my best friend , she was a gorgeous little kitten , very friendly and loved her cuddles. Marme got along with everyone , she never hissed or attacked anyone which was very strange, she was a little darling and we loved her very much. Marme will be missed a lot. As she grew up she became a very shy cat but still lovely , her and amy didn't get along that well but she got along with Sheldon. She was a funny little cat , she loved to chase her tail , push the other cats out of their box and cuddle into sheldon. She was such a good cat and we will miss her so much , its so quiet now without her in the house .